Alcatel has renewed their partnership with the Sydney Rabbitohs, revealed strong 2018 market growth and talked up their plans for 2019. “This is an exciting day for Alcatel and the broader TCL Group in Australia as we grow our partnership with the Rabbitohs into one that will see the team proudly wearing our brand across their chest for at least the next two seasons,” said Sam Skontos, Alcatel VP and Regional Managing Director, South East Asia & Pacific. 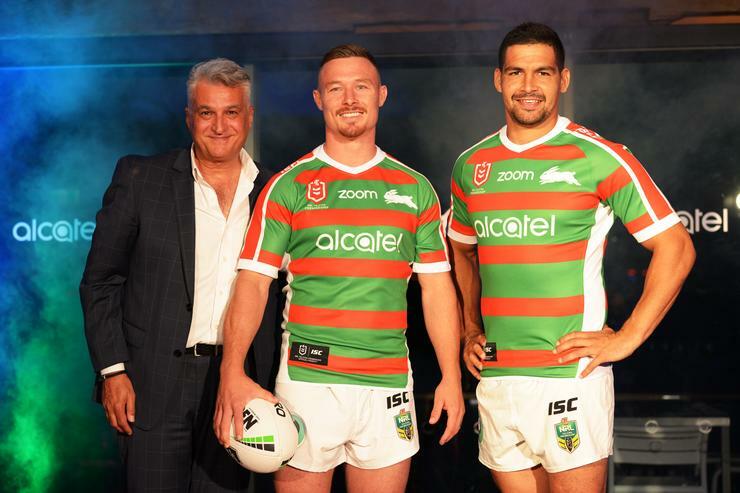 The new partnership will see Alcatel as a major sponsor visible on both the Rabbitohs home and away jerseys. The Alcatel brand will also be featured on LED signage at Rabbitohs functions and events, including the club's charity and community work. According to Skontos, "our brand fits the rugby league market perfectly, and our journey as an organisation mirrors in many ways that of Souths over the better part of the last decade. We have grown into a powerhouse brand in the mobile phone and tablet market with a focus on technology accessible to all, and we couldn’t be prouder to have grown the relationship continuously over the last eight seasons." Skontos says that Alcatel saw a 188% increase in unit sales and a 219% increase in revenue for the year, courtesy of the company's latest range of budget smartphones and tablets. TCL, the Chinese firm who own Alcatel, were also in attendance for the announcement. TCL's GM for Global Marketing Stefan Streit briefly took the stage during the event to not only tease that the company may be looking to be bringing a the revived PALM brand to Australia in the new year but also to talk up the company's intentions to develop foldable smartphones that compete with Samsung and others. Expect more news on this to come out during the TCL Press Conference at CES 2019, which will take place in Las Vegas next month.